Please welcome Corey Applegate as a guest reviewer to Cooking with Mickey. Corey is a stay at home mom and a lifelong Disney Addict. Her favorite things to do are plan Disney trips and spend time with my daughter. She'll be sharing her review of the Red Velvet Cupcake at Starring Rolls Cafe. 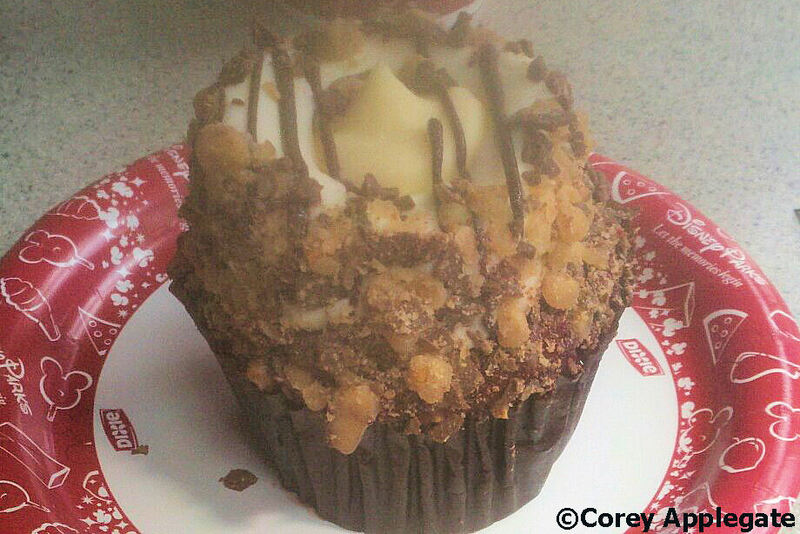 The Starring Rolls Café has become a popular spot in Hollywood Studios for cupcakes, the most “famous” being the Butterfinger cupcake. Recently, I made it a point to stop in at Starring Rolls to give one of the cupcakes a try and I spotted this Red Velvet Cheesecake Cupcake. Now, red velvet is my favorite kind of cake, and combining it with cheesecake made it a no brainer for me. The cake itself is self explanatory, and is a moist and flavorful red velvet. Piled on top of that is a delicious cheesecake icing. I am not a fan of buttercream icing because I think it is too sweet, so this cheesecake icing was perfect for me. It was not too sweet, and the cheesecake flavor was perfect. Add in the nuts on the sides and the drizzle of chocolate over the top, and this is my perfect cupcake. It is also so huge, that I actually ate it as my lunch, and was the cheapest meal I had in the whole park! I highly recommend taking some time to go check out Starring Rolls and their famous cupcakes, but please keep in mind that they are only open until 4pm, so you need to get there before dinner.